O.S. Vaidyanathan or Arun, as he is more popularly called, is undoubtedly one of the most gifted Carnatic Musicians in the Country. He is known for his sonorous voice that he wields with much confidence and musical personality and which he employs in tandem with his superior stagemanship. He inherits the mantle of singing from a family where music has been a way of life. He was given to Carnatic Music in the Parivar Parampara. He has performed widely, both in India and abroad. 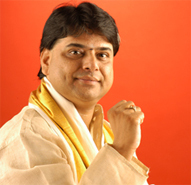 He has several cassette / CD releases of Bhajans / Carnatic music / Fusion Music/ Devotional Music & also sings for Commercial Films and has composed music for Private Cassette recordings, Video films, documentaries, and Ballet Productions. He has also established a Choir that he is very proud of. The Choir maintains the pristine grammar of Carnatic Music. He is an adept singer who is known for his sonorous voice that he wields with much confidence and musical personality, and which he employs in tandem with his superior stagemanship. His choir and The Alapana trust that he manages, are standing examples for his desire to nourish young and new talents. His remarkable control over the music idiom and his astounding range of music in performances have often proved the remarkable ability of this artist to infuse traditional compositions with new vocal vigour, and the impact has always been one of inordinate vocal power which was always married to grace. He began his music lessons under the careful ear of his father Vidwan O.V. Subramaniam. He later qualified Alankar Purna from Gandharva Mahavidyalaya. He also topped the Sangeetha Shironmani diploma course in Carnatic music conducted by the Faculty of Music and Fine Arts at Delhi University. Known for its vitality, his Music has combined grace of sound grammar and warmth of feeling. He also topped the Sangeetha Shironmani diploma course in Carnatic music conducted by the Faculty of Music and Fine Arts at Delhi University. December 2000 Arun Was conferred the title Brahma Gana Samrat by Brahma Gana Sabha, chennai. 2001- He was Awarded Best vocalist award by Music Academy,Chennai. 2003- He was awarded with four awards for the Sub-Senior Vocalist awards by the Music Academy, Chennai. 2003- Arun was conferred the tile "Bhava Sangeetha Vasigara" by Swamy Shantanandha, Founder President, Temple of Fine Arts International. 2005- “Madhura Ghana Sironmani” by the Canberra Vanoli Thenasia Sevai & ATBC, Canberra, Australia. 2006 - Swara Raaga Saarangyar by the Panchamukha Anjaneya Trust, Chennai. Nama Sankeerthana Ratna by the G.K. Foundation,Chennai. Kalaimamani by the Tamil Nadu Government, given by The Chief Minister of Tamil Nadu, Dr J. Jayalalitha. Madhura Gana Siromani by Shri Prakash Cultural Heritage Research Centre Chennai. NCA Excellance 2006, and Gold Medal, award by Nugambakkam Cultural Academy Trust chennai. 2007- Senior Vocalist award and Gold Medal, for Best Pallavi Singing. by the Music Academy, chennai.